The municipality of Houten has been awarded the honourable title of Cycling City 2018! This was announced by Stientje van Veldhoven, State Secretary for Infrastructure and Water Management on a cycle congress in Utrecht. Houten has won this title before, in 2008. It has the advantage of being designed with the bicycle in mind from the start, but that does not mean this title is a given. Houten only got it again, because it continues to cater well for its cycling population. It was their satisfaction and enthusiasm, speaking to the jury from the results of a large-scale public survey, that mainly led to this new title. 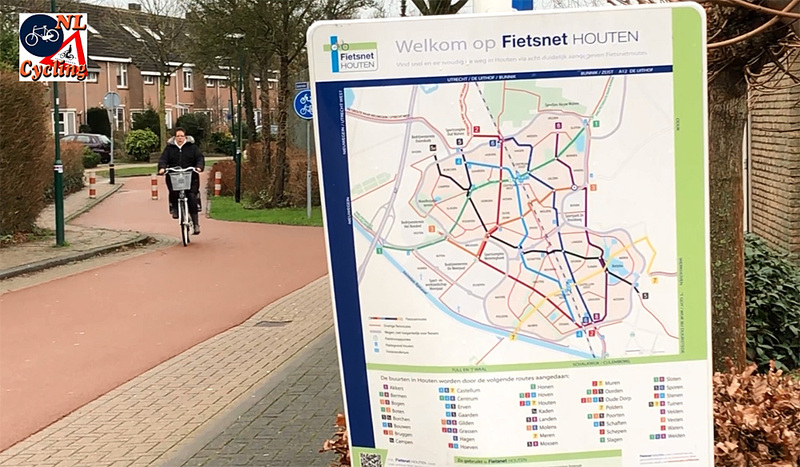 The cycling network of Houten on a sign in the streets. Houten has been awarded the title because the residents of the town were very positive about it in a survey. Previously I wrote a lot about the earlier elections ahead of the award ceremony. This time I had to be silent as I was honoured with a place in the jury. I was not able to give you a portrait of the five nominees without giving too much away about the jury’s view of each of these nominees. To make up I did make a video about the winner Houten, that you can see in this post! Houten’s main street from the new town centre to the railway station is only for people walking and cycling. No motor vehicles are allowed in this area. As you will be able read in the jury report, that I translated for you in English, the members of the jury were a bit disappointed that we didn’t get to experience the cycling in the nominated municipalities first hand. I was the lucky jury member who happened to have cycled in 3 of the 5 nominated towns. I also know 4 of the nominees well. I only never visited Winterswijk. However, in this particular election we were asked to look at what the residents themselves found, combined with some objective facts. Even so, we felt that we needed to extend that task by trying to find more hard facts that would support the views of the residents; to make the decision better. 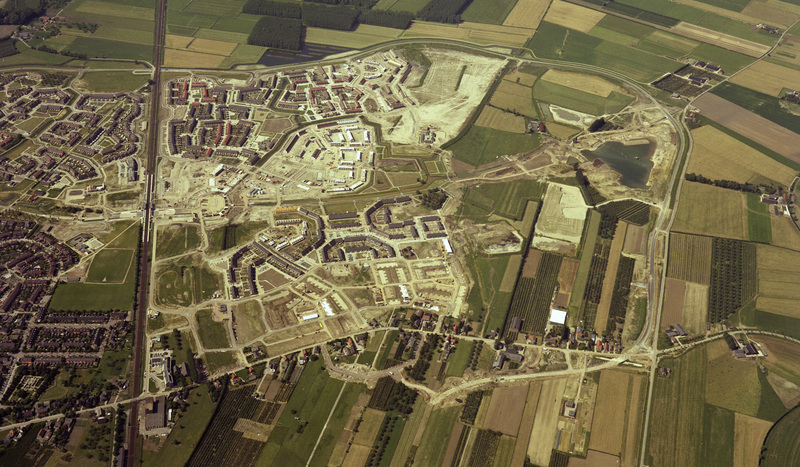 An aerial picture of the north-east corner of Houten under construction in 1983. Clearly visible is the ring road around what still has to be built. In the foreground this ring road suddenly stops and connects to existing roads. It would be finished later. Picture Utrechts Archief. The north-east corner of Houten from Google maps, circa 2010. The circular road has been finished and all the homes were built. Houten is very green. This part of Houten has few straight streets. The designers wanted to make streets appear shorter than they are to give them a village appearance. The downside is that finding your way is not easy with such short sight lines. The straight railway line from north to south is very visible. In the case of the winner Houten those facts speak volumes. Houten seizes opportunities when they arise. Notably with the expansion of the railway line from 2 to 4 tracks from 2007 to 2011. 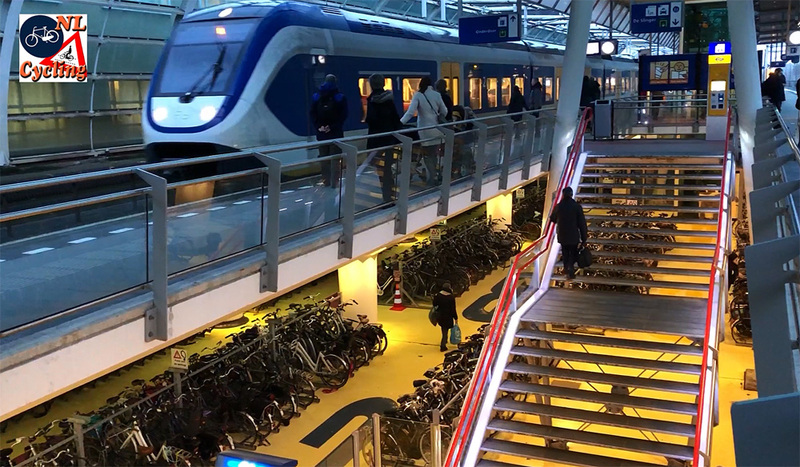 The municipality asked the railway building company to elevate the tracks with 1.8 metres (6Ft) extra, to get the space needed for a high-quality bicycle parking facility directly under those railway tracks and to make the tunnels, which would become twice as long, less dark. Costly for the railways, so it wasn’t easy to persuade them, but fortunately it did happen! Houten’s “Fietstransferium”, opened in 2011, where people can ‘transfer’ from their bicycle to the train in a very good way. The walking distance to your bicycle is kept as short as possible and since all passengers exit via this area the social safety is very good. Your bicycle is not parked in some dark scary corner hidden far away. Houten also demonstrates to stay in touch with the latest developments: bollards were removed in many places. 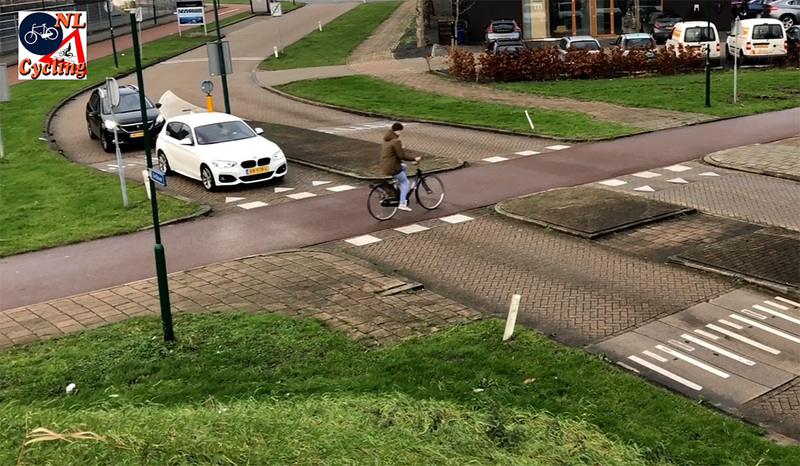 The current feeling among Dutch road safety experts is that an occasional illegal car on the cycleway poses less risk to people cycling than a bollard that is there constantly. However, you must monitor for every specific location if the number of cars does not grow so much that it tips the scale to the risk of the bollard being less again. This is a lot of extra work. Houten has removed many bollards on the cycleways. Bollards are meant to make the cycleways safer by preventing cars to enter, but sometimes they pose more danger themselves. Their absence makes it also easier to take the corner in a cargobike! Equal attention to big projects and little details to make cycling better. That is the signature of a great cycling municipality. Houten deservedly won this title. It is great that the Cyclists’ Union is going to share the data of the survey with all the towns and cities involved. The object of this election is to inspire and to improve cycling. It is hoped that this is accomplished when the municipalities get to know what their residents think and how they compare with other municipalities in the ranking. The “Fietsstad 2018” image. Picture from the Fietsersbond (Cyclists’ Union). The following text is a translation of the “Juryrapport Fietsstad 2018” published by the Fietsersbond, Utrecht – Netherlands, originally written in Dutch. The jury of Fietsstad 2018 (Cycling City 2018), Martijn te Lintelo (municipality of Arnhem, formerly Nijmegen), Mark Wagenbuur (blogger on Bicycledutch.nl) and Jos van Kleef (Goudappel Coffeng / Dutch Cycling Embassy) convened in Utrecht in December 2017 to elect the Cycling City 2018. The Cycling City election has changed. Unlike previous editions of the competition, site visits have not taken place nor was the assessment based on a specific cycling related theme this time. The jury judged on the basis of data provided by the Fietsersbond (Cyclists’ Union). This information came from a nationwide large-scale public survey held early 2017 and from different types of objective data. Data is becoming increasingly important, but the jury believes assessing the five nominated municipalities purely on data – without being able to experience the cycling climate first hand – is a difficult task. The jury limited itself to the five nominees, but wondered why none of the bigger cities were among the nominees. Does that have anything to do with busy streets due to higher traffic volumes in these cities? The town centre of the second expansion of Houten is also only accessible to people on foot or on bicycles. Before proceeding to discuss the five nominees, the jury would like to take some time to reflect on the role of cycling in Dutch municipalities. The jury sees that cities in the Netherlands are becoming increasingly denser. This spatial development is accompanied by a changing mobility development in which the car is given a less prominent role. On the other hand, the role of the bicycle is increasing. This more important role means that extra attention must be paid to the design of streets, but also to (built) bicycle parking facilities. The jury argues for better home-side bicycle parking facilities, particularly in the case of new buildings in a dense urban environment. Easily accessible bicycle parking garages are needed instead of inaccessible storage facilities. New construction is the moment that bicycle parking can be resolved in a sustainable manner. This should be obligatory, also in view of the quality of public space. Bicycle parking challenges should also be solved better and in a more sustainable way around public destinations that attract many visitors, such as inner cities. The current development of mobility demonstrates, in the jury’s opinion, that guiding vehicle choice is becoming more important. The jury wonders how you could use modern technology and Mobility as a Service (MaaS) for this guidance in a good way. The jury is happy to see that programs to trial the electric bicycle seem effective as a promotional tool. Obviously in relation to the importance of creating more high-quality fast cycle routes, so that people can cycle uninterrupted in a convenient way. Regarding MaaS, the jury would like to see special attention for the combination of the train and the bicycle. That combination must be improved, despite all the efforts we have already taken. The bicycle and the train should be an alternative for more (longer) car trips and for a larger part of the population. The bicycle must be promoted not only to get to the train, but also to get from the train to the final destination. That means better cycle routes to stations, but also better, faster transfers of a higher quality and with less costs. MaaS can give a new meaning to this combination. What the jury further notices is that cycling policies can be a reason to reverse previous political choices. This could involve downgrading inner-city roads and re-opening a previously filled-in canal. Or the expansion of areas where it is pleasant to stay longer by giving cycling privilege. 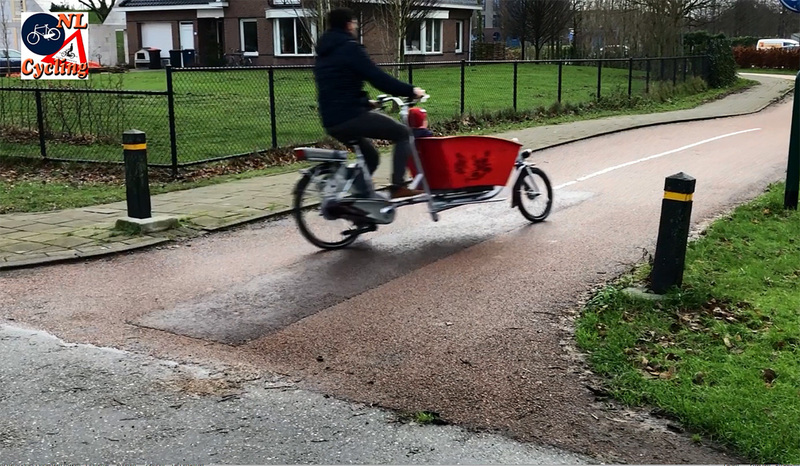 For instance, by constructing cycle streets with priority for cycling over motor traffic. It is good to see that these decisions benefit the higher goal, which is improving the living environment, and thereby the quality of life. The jury also regards this as a warning: non-sustainable policies are not easily reversible. It is, therefore, important to give the bicycle a smart starting point early in time. 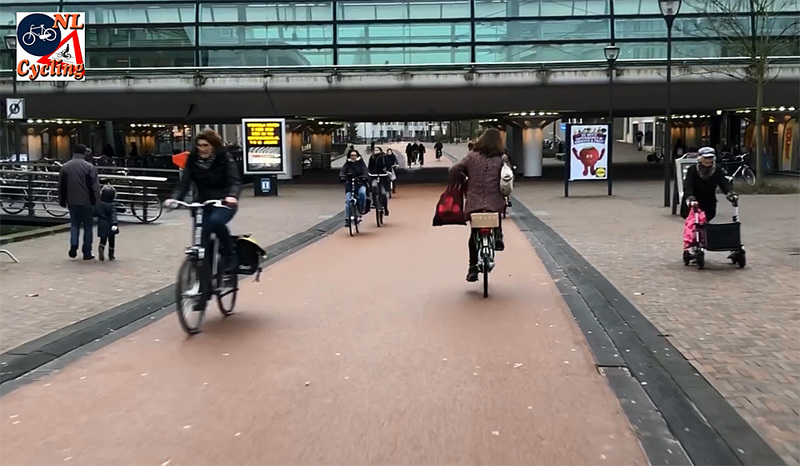 Good reflection and cooperation in the planning and design process of the built environment and the early integration of high-quality bicycle connections remains necessary. Here, too, the private car must settle for a less privileged position. This line of thinking does not only apply to spatial planning, although it has a longer lasting impact in that field, but also to road design. It is striking that the Netherlands still has municipalities where cyclists do not have priority on roundabouts within the built-up area. Even in the F10, the league of ambitious cycling cities, there is one municipality which has not implemented this for 100%. Even though this cycling measure is a national guideline that has been promoted for years, by the national government, the Fietsersbond (Cyclists’ Union) and SWOV (Institute for Road Safety Research). The jury also wants to look ahead. New developments follow each other at a high-speed. The future of mobility is “connected” and “automated”. We need to find out what this means for the bicycle, but connected cyclists (not bicycles) seem to be a promising option, for example by managing traffic lights to prevent unnecessary stops. The jury is very excited to learn about new possibilities that will arise – now that the first tests are already taking place – to strengthen the position of cycling in the city and the urban region. Children enjoy a great freedom in Houten. They can cycle wherever they like; unaccompanied. In the background a remaining bollard. Where they are absolutely necessary they remained. We will now address the five nominated municipalities, in alphabetical order, before arriving at a conclusion. Etten-Leur is not a well-known name in the Cycling City election. But it is a municipality that works hard on the further implementation of Sustainable Safety and that is appreciated by the population. Recently, 17 km of cycle paths have been upgraded and two new bicycle parking facilities have been built. Due to its spatial density and size, destinations can always be reached within cycling distance. Etten-Leur has been a forerunner in the construction of a regional fast bicycle route to Breda, as we know such routes on many locations today. Houten has been crowned Cycling City before, in 2008, 10 years ago. Since this title a lot has happened, also with cycling. For example, the innovative bicycle to train transfer facility was opened at Houten station and the city expanded with Houten-South. Based on previous experiences with spatial planning and stimulating cycling, choices were made, sometimes different, such as more shared road use at lower speeds. The consistent choice for the bicycle as a viable means of transport has led to a municipality where cycling has become even more the norm, with freedom of choice for residents regarding car ownership and car use. 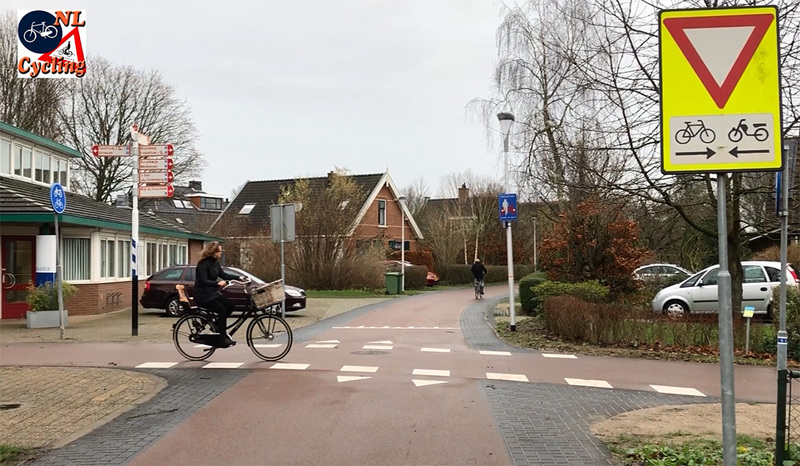 Because of its specific bicycle-friendly design, Houten is a municipality that serves as an example for other municipalities when it comes to designing new residential areas. Veenendaal is also a former title holder, although that was a bit longer ago (2000). It is a municipality that was mainly developed during the time that the car had a more important role in the Netherlands. Still, Veenendaal became a city of cycling through constant attention to the needs of cycling. The density of the built-up area is important here, but certainly not less important is the quality of the infrastructure, which is also appreciated by its own cycling residents. Winterswijk is a municipality where every cyclist, young and old, feels very safe and can cycle in a relaxed way. 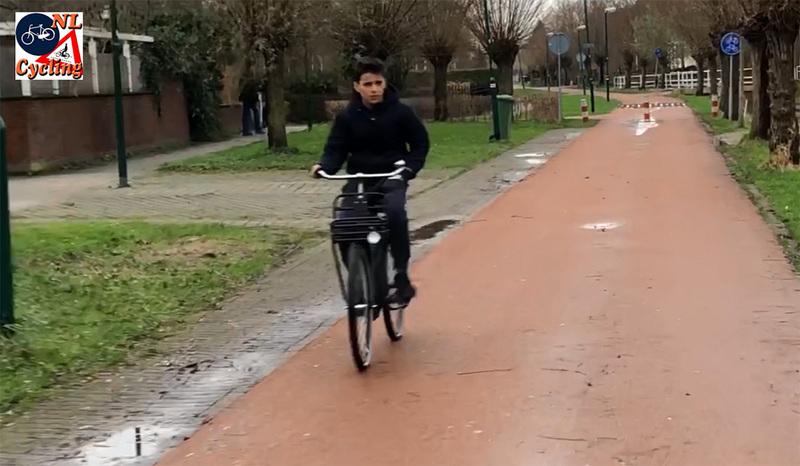 This appears to be possible – perhaps helped by the traffic volumes and the scale of this municipality, according to the jury – without much specific bicycle infrastructure being available in the built-up area. Winterswijk scores very well on direct connections. Making detours to arrive at your destination is not necessary here. Zoetermeer participated in the Fietsstad election several times, but this is the first time that it has led to a nomination. It is a municipality where the bicycle network is detached from the car network for large parts, which greatly improves road safety. However, this large-scale unbundling requires special attention to social safety in the dark. With a specially designed Nachtnet Fiets, (Night Cycling Network) Zoetermeer is very inspiring. A crossing with priority for cycling. It is very clear to drivers who has the right of way here. The continuous asphalt is the cycleway. The car lanes are in brick. There are road markings indicating the priority and signs and there is a speed bump just ahead of the crossing, also only on the car lanes. Since most of these drivers are residents of the area they also know that cycling has priority in this town. With these five very good cycling municipalities, the jury started its deliberations. During the deliberations, there was a lot of attention for the importance of the data in order to arrive at a good assessment. A scale that tells something about how it is to cycle in this municipality as a more vulnerable cyclist, think of 8-year-olds and 80-year-olds. How do people experience cycling in this municipality, is it stressful or relaxed to cycle here? Is the cycling network chosen logically, can you easily find your route and are there not too many detours? How is the infrastructure management, is there sufficient comfortable pavement, are there enough good quality parking spaces? Is the infrastructure well maintained? Think of aspects such as drainage and potholes in the surface, but also snow clearing and the removal of leaves. If we plan trips from a central point to points that are 1 km away as the crow flies, how much more should we cycle than that one km? What is the density of the municipality’s built-up area, the denser, the more destinations are within cycling reach. Are the roundabouts in the municipality designed to give cycling priority over motor traffic? It is a pity that important insight about traffic safety is still lacking. The jury took another important parameter, the number of kilometres cycled per person year, from the OViN (Research of Movements in the Netherlands, by the Central Statistics Bureau). 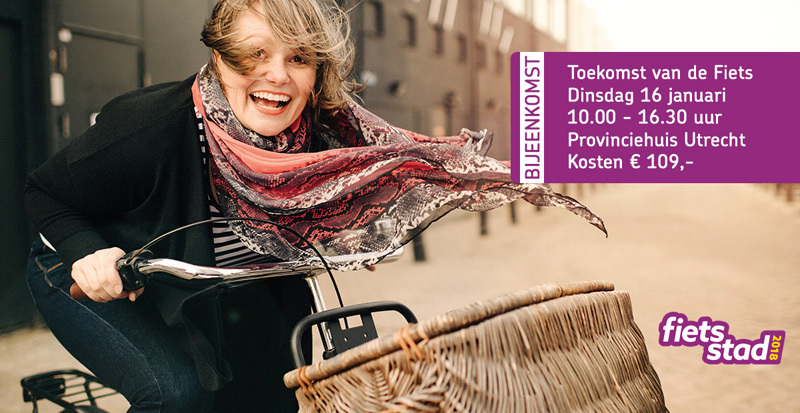 Etten-Leur stands out in a positive sense because of the density of the bicycle network in the municipality. Also, the detour factor (not many detours) scores positive in Etten-Leur, just like the density and 50 km/h streets separation. The number of bicycle kilometres per inhabitant is a bit on the lower side compared to the other nominees. Houten scores high on cycling for 8 to 80-year-olds, experience, network, infrastructure and maintenance. The detour factor and 50 km/h separation score excellent as well. Houten (together with Winterswijk) scores the highest of the nominees when it comes to cycled kilometres per person per year. Veenendaal scores well on experience, network, infrastructure, maintenance, density and the 50 km/h separation. Veenendaal also scores high in terms of bicycle kilometres per person. Winterswijk scores high on cycling for 8 to 80-year-olds, experience, network, maintenance and the detour factor. As previously stated, Winterswijk scores the highest number of cycled kilometres per person per year, together with Houten. Zoetermeer scores high on experience, network and infrastructure components. In terms of cycled kilometres per person per year, Zoetermeer is in the lower regions of these nominees. The roundabouts are designed well for cycling in all nominated municipalities. An intersection between a cycleway and a cycle street in Houten. The cycleway has priority. A Cycling City must inspire, set an example, encourage other municipalities to also want to go that far. It is not just about mobility, it is about quality of life, health and the living environment, in which the bicycle and more cycling is an important means. With this in mind, the jury assessed the municipalities. If we look at the figures, we see that a lot goes really well in all the nominated places. But also, that – based on these figures – one municipality rises even further. A municipality that has constantly and consistently implemented high-quality cycling policies for years. A municipality that once again rolled out its own success model in the past decade, adjusted to the present time. We are talking about Cycling City 2018: the municipality of Houten! 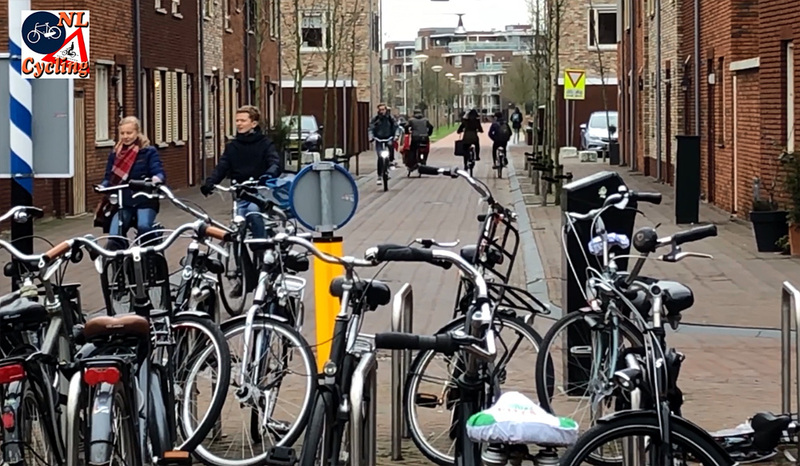 My video portrait of Houten, Cycling City of 2018. Even on a grey January day the cycling town looks beautiful! Above you wrote: “On the other hand, the role of the bicycle is increasing. This more important role means that extra attention must be paid to the design of streets, but also to (built) bicycle parking facilities”. Beautiful infrastructures for bicycles already have been built. Facilities at the end of those infrastructures, like parking facilities, have been built also. Now we need to ‘build’ a service system to service those cyclist who have a broken chain, brake cable or even a puncture. Just like the ANWB, an organization that started as cycling union, has for cars, the WW. I don’t know whether this WW can help stranded cyclist, but they are more adapted for cars. Hence, we need a WW for cyclist. I have already seen two vans, which are specially for servicing cyclists. One van was private. The other van was from a company who sells e-bikes. Is it possible to shape it in a organization? Thank you Mark, excellent blog and interesting comments, particularly about Amsterdam. I am wondering if an objective safety rating was considered? (e.g. injuries to bicyclists per million trips). Is it that reliable and timely data is not available that would allow such a comparison? For cash-strapped councils in Britain (like Gwynedd where I live) who would like to encourage more people to cycle but for whom any help from the government to invest in decent infrastructure is a distant dream, it would be interesting to hear more about Winterswijk. How did it manage to be so cycling-friendly ‘without much specific bicycle infrastructure being available in the built up area’? Excellent video and a worthy choice! In the video I think you mentioned the “train company” in conjunction with the discussion of the train station. I’m curious about how all that ownership takes place in The Netherlands. Thanks! Keep up the outstanding work! Thankyou Mark, for your presentation of the results and your excellent video of what riders experience in Houten. Thank you for all that you do for cycling. How is it decided to expand a town’s boundaries? 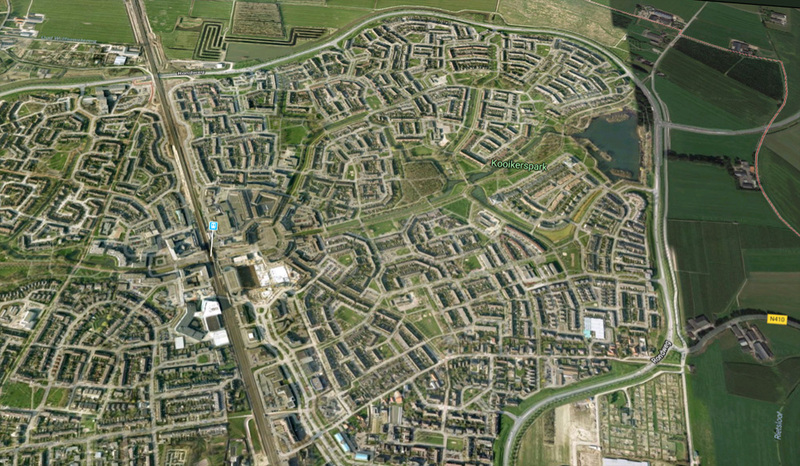 Like what Houten did to complete their figure-8 expansion. The maps in the article and video make it seems like there is an urban boundary that prevents growth beyond the ring road. That was a decision by the national government in the 1960s. Houten was designated to be the place where people could live who couldn’t find/afford a home in nearby Utrecht. This was a measure to counter sprawl. The municipality of Houten is much larger than the ring road (figure 8). There are in fact separate villages that belong to Houten. See this picture from Wikipedia. Ah. With those 5 scales Amsterdam could never win: 8-80 (not for the young and old) Experience (not relaxed) Network/Infrastructure (battle field, narrow lanes) Maintenance (sort of okay). In comparison, here is Amsterdam with some other well-known municipalities (at least among cycling infrastructure fans). After the category there are average score; 8-80; experience; maintenance; infrastructure. 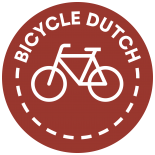 This entry was posted on 16 January 2018 by Bicycle Dutch in Original posts and tagged Fietsstad, Houten, infrastructure, urban design, urban planning.